Known as the "Creature Crew"
David has been working in the haunting industry since 1984. He has worked with the March of Dimes Haunted Mill, Red Moon Theatre, Fearlandia, and the West Coast Haunters Convention. He has worked as a counselor, teacher, speaker, writer, actor, and business consultant in OR, WA, UT, and IL. For the last 20 years, he has served on the boards of numerous government, business, and non-profit organizations. He was the theatrical haunt/occult consultant for the “Bureau for Paranormal Research and Defense” (BPRD) Hellboy Camp for Trackers Earth 2012- 13. David draws upon an impressive knowledge of deep-themed story writing, therapeutic milieus, business, mythology, folklore, music, ancient history, education, theatre, and technical craft to create successful haunts while providing an emotionally supportive process to the customer and achieving high fiscal performance goals. Matt is a true jack-of-all-trades. A founding member, Matt participated in the original Mary Origin Story. Our team won “Best Scene,” and we’ve run the majority of the West Linn Haunted Trail ever since. Matt enjoys working with animatronics, sound, visual design, and props as well as developing storylines. He’s an expert in utilizing distraction and drop-scares to achieve some of our biggest scares. Matt is always looking for new ways to innovate and was involved in creating 2016’s summer promotion where people attending local events and activities could “search for Mary” in a 3D video environment. Additionally, Matt puts on an annual “Carriage Way Cemetery” (https://www.facebook.com/ carriagewaycemetery/), started 11 years ago. Matt has a PhD in chemistry and over 20 years working in the high tech industry where he has published numerous technical scientific publications. Doug has been in the haunting business since adolescence, and he has designed and built haunted graveyard scenes, animatronic creatures, puppets, and sets for haunted houses and trails for over 25 years. 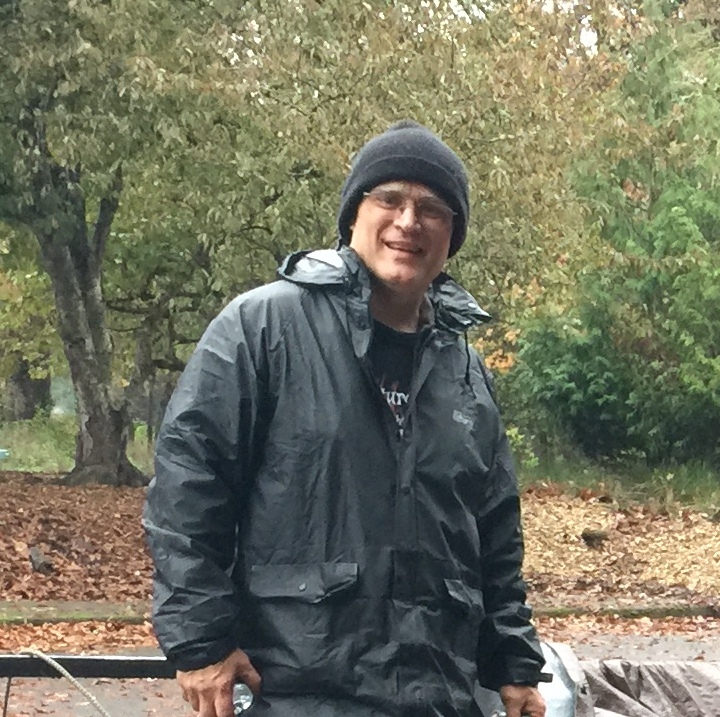 Doug was recently featured in a segment on KATU News about the haunted house he created on his property and ran as a benefit for the Oregon Food Bank. His privately built and funded project received over 500 pounds of food and $1,500 in cash. Prior to that, Doug assisted in larger fundraising efforts to benefit DARE and then the Ronald McDonald House, comprised of a 10,000 SF haunt, running 3-4 years and raising $30K each year. Doug brings over 30 years of experience as a licensed architect when designing and building his creations. A founding member of Creatures, Derek has 35 years of high tech and costuming design for haunts. A Maker by nature and a software engineer by profession, Derek also has extensive training in competitive ballroom/swing dance, modern dance, martial arts, public speaking, and voice acting experience, for which he has won many awards. He has specialized in custom-programmed, microprocessor-controlled LEDs and sound within large automations. He also built projects ranging from tiny digital fireflies to giant programmed glowing mushrooms, and 20-foot-tall illuminated obelisk with color-shifting tentacles. His experience with digital photography/editing is enhanced by his work with vector graphic and CAD layout. He has designed t-shirts, talking trees, a spinning "Wheel of Misfortune," simulated fire/explosions, and an impressive variety of improbable head ware. Sharman has a Master degree in Environmental Science and a Bachelor degree in Marine Biology. 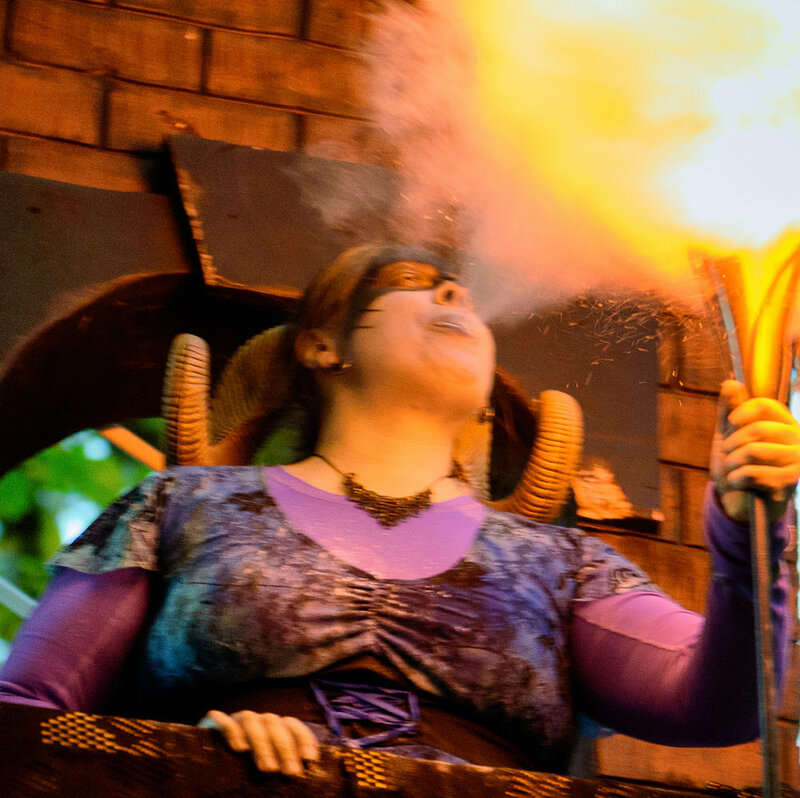 A founding member of Creatures, she brings her scientific, management, and engineering background mixed with a creative, outside-of-the- box approach to Creatures of the Night to help wrangle the 80+ volunteers that build, act, and support the West Linn Haunted Trail each year. She stays current on makeup artist techniques and costuming concepts to assist the actors in embodying their characters. Sharman and her family have been a part of Creatures of the Night since the original Mary’s Origin Story, helping to design, create, build, fabricate, and act within the Haunted Trail. Brandy is a founding member of Creatures of the Night. Her first goal in haunting is to make the process accessible to all volunteers, whether they have twenty minutes or twenty weeks to commit to the project. Brandy helps volunteers learn new haunting skills, including prop building, costume making, and theme design. Brandy is a graduate of Loyola University Chicago, where she designed and built costumes for the university's theater department. A life-long seamstress, Brandy helped imagine, source, and build signature "bad guy" costumes and sets for the West Linn Haunted Trail. Kendall has over 12 years of experience teaching in formal education and almost twice as long in informal education. She found her passion for teaching once she joined the Zoo Teen program at the Oregon Zoo. She started in the Zoo Teen program in the late 90s and has continued to be involved with education ever since. Once Kendall completed the Zoo Teen program she entered camps and overnights. She has a great passion for teaching others about the world around them and the animals at the Oregon Zoo as well as getting others around her excited about conservation. When not teaching in the classroom or at the Oregon Zoo, she creates and implements events for friends, family, and the community. Kendall has been playing the flute for 20 years, and she performs with the Rose City Flute Choir. Kendall is also a member of the Artisans team at Trackers Earth. With Trackers, she teaches environmental science and wilderness survival through story. While teaching, she makes costumes and outdoor special effects for the program as well as helps create storylines. With 25 years as a marketer serving architects, engineers, and contractors as well as those in various creative fields, Heidi enjoys helping her clients promote their arts, crafts, and professional services. She is a gifted writer, is passionate about helping others, and loves supporting our crew to transport haunt participants to another realm. 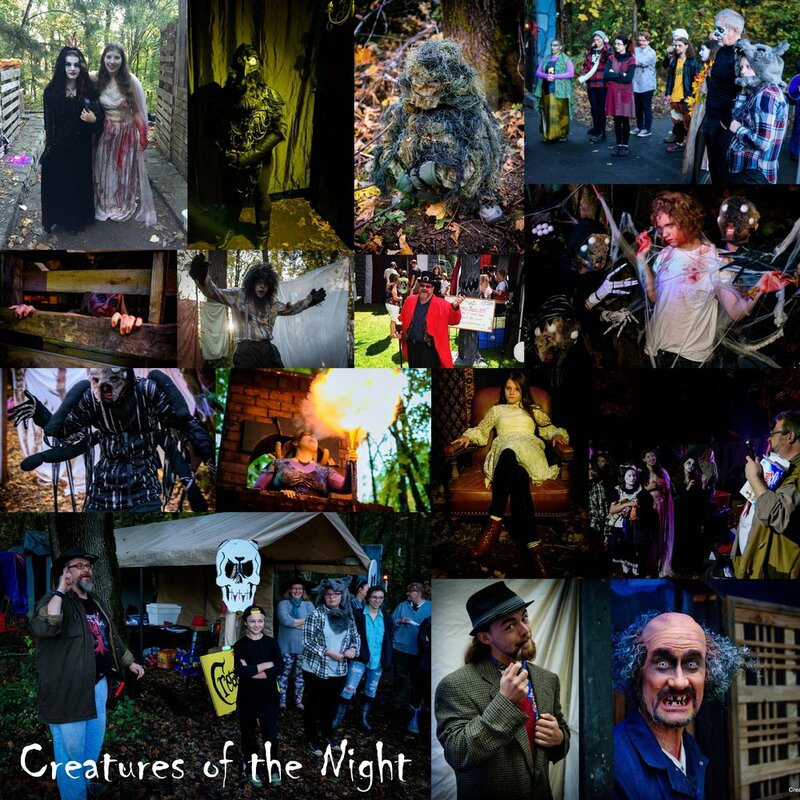 She has been involved with the Creatures of the Night and the West Linn Haunted Trail for the past two years, and she has become a steadfast supporter in the planning and implementation of the event, along with her two children who participate as set builders, prop fabricators, and actors. A founding member, Lindsey has served as our artist-in-residence ever since. Her magnificent and distinctive artwork has created some of the most memorable poster and large format (billboard) advertising to help double attendance numbers at targeted haunted entertainment venues. Her original prop creations elevated a simple home haunt competing in a large city fundraiser to the formation of the urban myth of the Protective Spirit Mary. Author and photographer of Graveyards of Chicago (Lake Claremont Press, 1st edition 1999, 2nd edition 2013), Matt has twenty years of experience exploring graveyards, photographing cemetery monuments, and researching local history – including ghost stories & urban legends. Now relocated to the Northwest, he has redirected his creative energies to landscapes, portraits, and the haunt. A software engineer by day, he also provides assistance with the Creatures web site. Jennifer brings with her 12 years of community and professional theater experience at Oregon State University and Lakewood Center for the Arts. She specializes in the fabrication and procurement of properties as well as costume design and construction. Jennifer has immersed herself in the experience and became a Scene Lead as well as an actor. She also brings her experience as a Production Planner to the group and enjoys being involved with the” big picture” planning and schedule development. Addie has been involved in community and professional theatre for over 16 years, starting at Mt. Hood Community College where she served as a Scenic Charge Artist. She continued theatre in many capacities at Oregon State University before beginning work with local theater companies as a crew member. Her home theater is Lakewood Center for the Arts where she served as crew before moving on to Assistant Stage Manager and Stage Manager positions. She is also an amateur theatrical make-up artist and specializes in horror and zombie looks. Addie joined the Creatures team after volunteering to stage manage the West Linn Historical Society's Willamette Living History Tour where she met others involved in the Haunted Trail. Her stage management and theater experiences have made her an asset to the planning and organization of the Haunted Trail. With amazing leadership skills and a drive to create a fun learning environment, Kaiden serves as a student coordinator for volunteer work sessions. He also works as a scene manager and lead queue line actor, builds sets and props, and actively participates in planning sessions for the development of the season’s storyline.